The wines made and aged in our bodega are done so using the traditional soleras and criaderas system, which is unique to the Jerez-Xeres-Sherry D.O. Fino, Oloroso, Amontillado and Palo Cortado are all made from Palomino grapes. 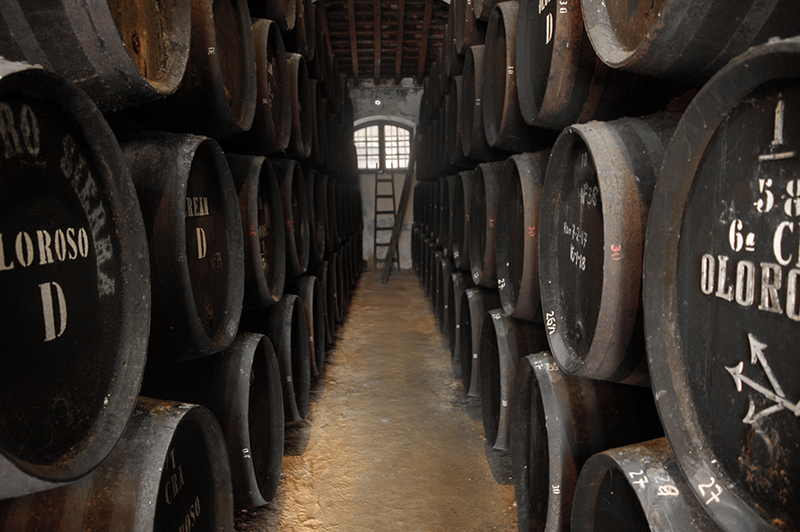 Pedro Ximenez is made from a grape of the same name, which is also used for coupage, the blending of Palomino and Pedro Ximenez to create Cream and the original Amoroso (Medium), unique to El Maestro Sierra. The harvest of the Palomino grape normally takes place around the end of August or early September. After harvesting the grapes are taken to the bodega for the extraction of must; then this is conditioned and filtered to improve the aroma and to avoid cloudiness. After this process the fermentation begins, resulting in a white wine with 11 – 12.5% alcohol. This wine is very dry and delicate, slightly fruity and with little acidity and provides the base for the final wine. From this moment the wine will follow different paths according to the final result: Fino, Oloroso, Amontillado or Palo Cortado. The basic wine that precedes the final product is called “Mosto” and in Jerez it is also traditionally consumed, especially in winter. Moving on to the vinification of the Pedro Ximenez grape for the making of sweet wines, which presents some unusual characteristics when compared to the dry Palomino wines. The wine is extracted from over-ripe grapes that are harvested when they reach a sugar level of 16% baumé; approximately 300 grams of sugar per liter of must. After harvest during the summer months, the grapes are put through the process of “Soleo”, drying them out in the sunlight. This process lasts for around 15 days, resulting in significant loss of water and therefore concentrating the sugar level. The grapes will then intensify in colour, density and new aromatic notes will develop. Once they have reached the desired conditions, they will be taken to the bodega for the extraction of the must, starting a slow process of fermentation and being fortified up to 10% alcohol. During autumn and winter months, the wine is clarified and it is finally fortified up to 15%. Then the wine will then start a five year ageing process through the soleras and criaderas system. «Wine is the only work of art, which can be drunk».